It’s unusual you would hear from me two days in a row, but I need to tell you honestly, I can’t help myself. While I spent yesterday fasting and focusing on Christ, today I can’t get you off my mind. Yes, you — His scattered flock. At first I thought these feelings had more to do with extending the intensity of yesterday’s thoughts. If you read my post last night, Wrecked for Good by the One Who Traded His Life for Mine, you can garner a glimpse of the heaviness of my heart. 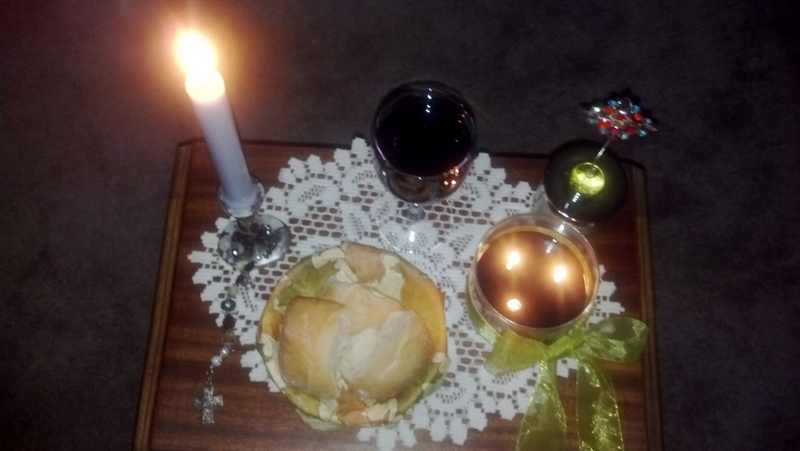 To ease into rest and to give my Lord a proper thank You, I carefully arranged a sacred space in which to share communion with Him, ending a period of fasting. I longed for connection. My special table setting included not only the traditional holy sacraments, but other pieces of significance, some given me by my spiritual family — a Celtic cross, a silver candlestick, an acacia bowl for the broken bread, a small decorative piece made of stained glass and one of my sister’s candles, all nestled on one of Mom’s doilies atop a phone stand that belonged to my grandmother. I even draped a delicate and flowing length of green ribbon that once wrapped a meaningful gift sent from a California friend. I listened to a couple of songs, prayed for a good while and cozied up in the quiet with the Lover of My Soul. As I cleaned up from our evening together, I couldn’t push from my mind His scattered flock on the night of suffering. Of course they fled. Questions formed. Would they have thought their own deaths next? Lurking in shadows, fixed not on Christ, but on the cross, would they act out the very denial Peter spoke? What would I do if Jesus were dead? Would I deny the life He once gave? The calling of the Kingdom here on earth? Would I lie in bed, covers over my head, shaking for fear of being found? Ummm . . . well, yes. I think I might. I think I do. Don’t you? The thread of tears continues. I’m not so unlike those scattered, beat up believers, watching from a distance, hiding among the shadows as if I were lost and without a Shepherd. I’m guessing, neither are you, since God brought me here and asked me to gather you. I don’t know all that I’m to say once we’re together. But I do know I’m willing to step out of the shadows to be found—for you, with you. Unlike the followers who surely must have scattered on that night of Suffering, I have seen what waits on the other side of the stone. Have you? Then we have some talkin’ to do. There, I followed the thread. Sadness dispelled, it’s time for that walk. Join me?